Playtonic says the Toybox demo is coming to backers in July. It was just over a year ago that the Banjo-Kazooie-inspired Yooka-Laylee walked away with more than £2 million ($2.9 million) on Kickstarter, an especially remarkable achievement given that its goal was £175,000 ($254,000). 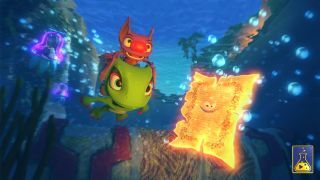 Things have been pretty quiet since then, but developer Playtonic Games revealed today that the studio has tripled in size over the past year, relocated, and "quietly slaved away on what would become the final form of Yooka-Laylee." The update includes a couple of new screens, introduces a pair of new characters—the “ruthless, exosuit-wearing fowl” known as Dr. Quack, and his former prodigy, the upstanding, multi-limbed Dr. Puzz—and reveals more about the game's many collectibles. There's also confirmation that the Toybox, “a self-contained, spoiler-free sandbox” demo, will be released in July to appropriately-tiered Kickstarter backers, and that it's taken longer than expected because it has grown into “a much more significant chunk of playable content” than had originally been planned. There's no release date yet, although Playtonic said it's “working towards the same release window penned last year.” More information will be coming over the next few weeks, and Yooka-Laylee will also be making an appearance at E3 in June.